The Health and Biomedical Informatics Centre (HaBIC) is hosting HL7 Australia’s third annual Work Group Meeting (WGM) on 7 & 8 November 2016. University of Melbourne staff and students can attend at no charge. Following the format of past WGM, the event will include presentations from key speakers, work group meetings and a FHIR Connectathon.Expanding on the desire to build a collaborative community, this WGM will include a new element with a ClinFHIR session aimed specifically at clinicians. The importance of supporting engagement between clinicians and developers cannot be refuted and it forms a key point of the Standards Development Initiative. ClinFHIR – Monday 7 November 2016. A key success point for any health informatics standard, including FHIR, is the understanding of clinical use cases and scenarios. This involves active collaboration between developers with clinicians across a range of disciplines. Internationally, this is an area being supported by HL7 International, and HL7 Australia is following this position on a local level. Who should attend? Clinicians and other healthcare providers, medical students. Enrolments are open now until 30 November for the new Health specialisation in the Master of Information Systems. 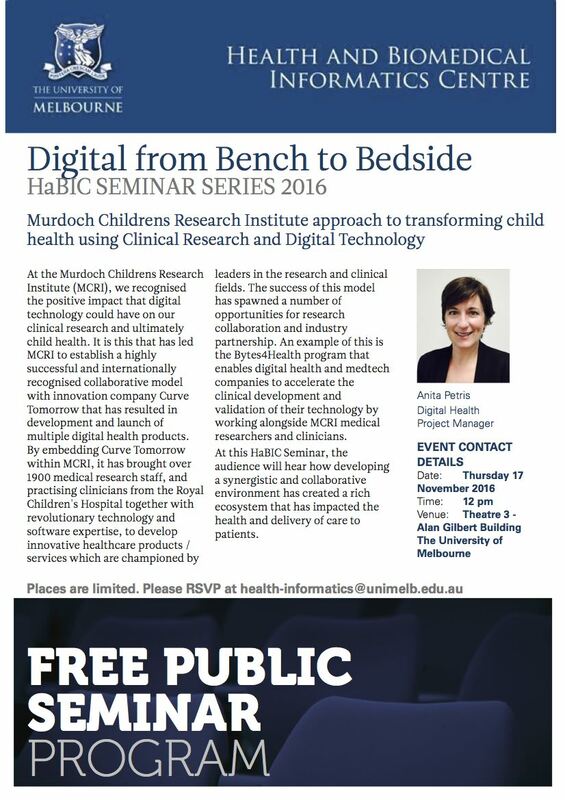 Enrolments will open soon and will run until 30 January for the new Graduate Certificate in Health Informatics and Digital Health, offered in the School of Population and Global Health. This Grad Cert can be used for credit toward a Master of Information Systems (Health) or a Master of Public Health. Semester 1 starts on 27 February 2017. Are you 55 years or older? Do you use a smart watch (e.g. Fitbit) or other wearable to keep track of your health and fitness? Do you have 20 minutes to fill an online survey? Researchers in the Health and Biomedical Informatics Centre at the University of Melbourne would apreciate your participation. The HaBIC August Newsletter is out. Information and communication technologies are transforming healthcare all around the world. The rise of Digital Health, E-Health, Mobile Health and Teleheatlh are giving new importance to Health Informatics knowledge and skills. In order to enable safe and effective change in health systems, standards, and strategies. Why study for a Graduate Certificate in Informatics and Digital Health? The Graduate Certificate in Health Informatics and Digital Health is designed for people now working, or planning to work, in the health sector who aspire to management and leadership roles as digital enabled healthcare professionals, health service providers, health policy-makers or health researchers. Visit futurestudents.unimelb.edu.au/admissions/applications for more information on the application process.